Are you trying to get your head around all the terms related to online credit card processing and online payment processing? If you’re wondering what the difference is between a merchant account and a payment gateway, we can help you with that. First the short answer: A merchant account is a bank account that accepts your company’s online payments and holds the money. A payment gateway is a provider of the technology that allows you to access payment networks. Payment gateway providers offer your company the service that processes credit cards for you. Your terminals and ecommerce site send credit card information to a payment gateway for authorization and for processing of the payment. If the charge is approved, the payment gateway transfers the funds for the charge into your company’s merchant account. A merchant account is essentially an online bank account that holds your money until it goes into your real bank account. When a sale is successfully completed, money is transferred into the merchant account where it remains for a few days before it is automatically transferred into your bank account. That means a merchant account is similar to a holding tank where you money remains until it’s released to you. Usually, independent sales organizations or ISOs provide merchant accounts. They may also be provided by member service providers or MSPs. These organizations have agreements in place with processors to provide merchant services and provide merchant accounts. Have you heard of a payment processor? That’s an important term too. A payment processor – also called an acquirer – is a financial institution that provides background payment processing to a merchant. In most cases, a payment processor or acquirer is a bank. These institutions form partnerships with the ISOs and MSPs that work directly with merchants and consumers. The acquirer provides the authorization of the transaction. We sincerely hope this discussion clears up some confusion about merchant accounts, payment gateways, payment processors and more. If you’re unclear about any of these terms or want to discuss payment processing in greater detail, we’re here for you at United Thinkers. 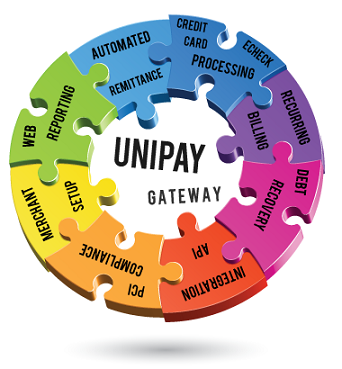 The UniPay payment platform may be the right gateway to process your transactions. We look forward to talking with you. Trying to get your head around all the terms related to online credit card processing and online payment processing? Find out the difference between a merchant account and payment gateway.